World of Tanks: Win a unique signed poster! 5 Comments on World of Tanks: Win a unique signed poster! The majority of you know that I’m a history lover, especially when it comes to First and Second World War military vehicles and recently while I was looking for some information about a particular vehicle, I’ve found a very special charity close to where I live. You most probably have seen their Jagdpanther on Youtube while not realizing it belongs to them and maybe you saw my recent visit to their workshop on my Facebook page and their latest work at Tankfest 2018, so who are they? The Weald Foundation was established to preserve, restore and maintain historic tanks and related military vehicles and equipment, principally from the First and Second World War and to educate the public about their history. Established as a charitable trust in 2003, the Foundation oversees a rare and unique collection of important tanks, armoured and soft skin military vehicles. It is considered to be one of the finest working collections in the world. For those who follow me on Facebook, have seen my pictures of their vehicles at the workshop and most recently, the Renault FT-17 and TSF at Tankfest 2018. These are original First World War tanks in working conditions, rare if not unique and the product of almost a decade of work and dedication. With the completion of their most recent projects, they are now starting to work on three German armoured cars: Sd.Kfz 222A, Sd.Kfz 223A and Sd.Kfz 223B. But that isn’t all, they are also starting to work on a second Jagdpanther German tank destroyer. With all these projects at hands, I’ve decided to team up with other World of Tanks Community Contributors and try to help them out and this is where you come in! 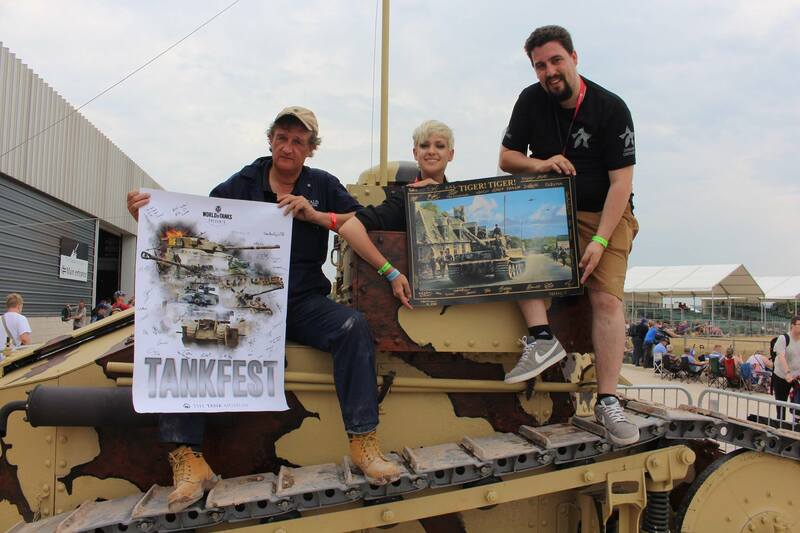 At Tankfest 2018, I’ve gathered the signatures of all Community Contributors and other special guests present at Tankfest 2018, in two very unique posters for me to giveaway to you. Names like Quickybaby, Dakillzor, Ritagamer, Sofilein, JustforlolzFYI, OneAndOnly and even MightyJingles, SirFoch, Chieftain and Challenger are just some of the names you will be able to find! A massive thanks to all who took their time to sign, support and make this possible. How to can you win one? There will be two ways you can enter and win a poster. The main idea is to fundraise, all donations will be done directly to The Weald Foundation, but I also wanted to enable any of you who can’t afford to make a donation on having a chance to win one of the posters. To achieve this, there will be two separate giveaways and you can enter in any of one of them, so here’s what you need to do. If you would like a chance to win the “Tiger! Tiger!” poster (see above), you will need to make a donation on a dedicated GoFundMe page. All donations will go directly to The Weald Foundation (full details on GoFundMe page) so you can rest assured your donation will reach its final destination. The winner will be selected from one random donation, so please don’t make an anonymous donation if you want to be eligible. All anonymous donations won’t enter the giveaway. Making a large donation doesn’t give you higher chances of winning, as the winner will be picked randomly. You aren’t required to tip GoFundMe, if you don’t wish to tip GoFundMe just select “Other” and enter £0.00 and your total charge will be £5.00. I’ve established a goal of £500.00 and don’t worry if we can’t reach it, the total amount donated will still be sent to The Weald Foundation. And if we do reach the goal, no worries too, people can still continue to donate and increase the total amount to be donated as the goal is there just as a objective value. So what are you waiting for? A minimum £5.00 donation must be completed. Donators must enter their First and Last name for their entry to be valid. All anonymous entries will not be selected for the random pick. Giveaway will start on 2 August 2018 at 12:00 PM (GMT+00:00) London and end on 20 August 2018 at 12:00 PM (GMT+00:00) London. If you want to have a chance on winning the “Tankfest 2018” poster all you have to do is reply to one question: What is The Weald Foundation Jadpanther tactical number? The answer can be found in this very article, find it and use it to enter the Gleam giveaway. And don’t forget, complete the extra entries so you can have higher chances to win and help The Weald Foundation. Participants must enter their First and Last name and a valid email in order to be contacted if they win. Participants must answer one question to enter the giveaway. Participants must enter the correct answer to be eligible. Participants aren’t required to complete bonus entries, but by not completing them, they acknowledge they have fewer chances of winning. The Organizer reserves the right to invalidate any duplicate or fraudulent entries. Access to Member Only areas of their website. You will receive an annual subscription to their weekly online magazine Inside Track providing in-depth updates on all their projects, significant discoveries and all major research finds. Keep your finger on the pulse of all activities at the Weald Foundation with regular contact and updates. Members will be invited to meet The Weald Foundation team at events at locations around the UK. Quickybaby signature complete destroyed the value of the poster. Why? He is a Contributor and like it or not he has a major follower base. I like Qb, he is one of the best community contributors and although he sometimes forgets we are not all deity level players his vids are informative and useful?????? ?